Parker Riehle of the Vermont Ski Areas Association. participating in winter recreation. What are some resources which we could use to learn about winter recreation and how to become involved? I am especially interested in how do it in the most economical way possible. We are a family with four children and the perceived high cost of winter sports has seriously concerned us. Is the constant building at ski areas sustainable? What is the end point of these developments? Is the out-building of these areas just ways to keep the money flowing? can buy, and a 7-day non holiday pass valid at both Okemo, Stratton and Mt. Sunapee (NH) is just $589. These are 2008-09 rates, and are subject to 6% tax. In response to your guests comments, I’d just like to say, first, that mid-week deals are a sham since most Vermonters work during the week and, second, that most of those jobs that the resorts provide are low-paying and low-benefit seasonal jobs. I myself find the serenity and calm of back country touring on such trails as the Catamount Trail. This seems to be a growing trend, with metal-edged back country skis. As an employee of Onion River Sports I see more and more people coming into get away from the resorts and into quieter, more wooded areas. What do you think resorts can do to attract these people? I see this as a growing trend. In the last several weeks, Vermont State Police, ski patrollers and other first responders have had to look for 47 lost skiers and riders, 45 of them in the Killington-Pico area. The head of the Vermont Ski Areas Association says it was a banner year for the state’s ski resorts. 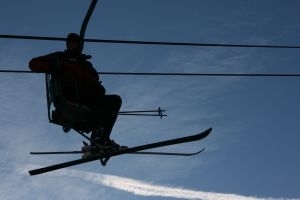 Parker Riehle says he expects that skier visits during the winter of 2007-2008 will surpass 4.1 million.